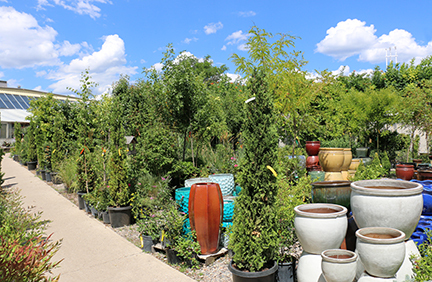 August is the perfect time to plant trees and shrubs, or anything else for that matter! The summer rains continue to cool the summer heat, increase humidity and increase moisture content in the soil. When planting a tree or shrub it is very important not to let any soil break away from the root ball. When this happens the tiny hair roots which are responsible for moisture absorption are broken away. With damaged hair roots the plant is less able to absorb water so the plant wilts. This is known as transplant shock. When removing a plant from its container allow the soil to dry beforehand as this helps to hold the soil together more effectively. Dig a hole 2 to 3” deeper and twice the width of the root ball. Mix equal portions of Payne’s Perfect Compost, Payne’s Soil Conditioner and existing soil. Place 2 to 3” of this mixture in the bottom of the hole and tamp down enough to prevent settling. Carefully place the root ball of the plant into the hole, backfill halfway up the root ball then place a running hose in the hole as you continue to add more soil mix. This is also the time to add root stimulator! Use remaining soil mix to build a 6 inch berm around the planting hole to ensure that it will hold plenty of water. Water twice a week until plant gets established. CLICK here for PAYNE’S HOW TO PLANT A TREE TIP.